The more I walk through Stockholm, the more surprising pockets I find of teeny wooden buildings that have survived urbanization for the last 400 years. 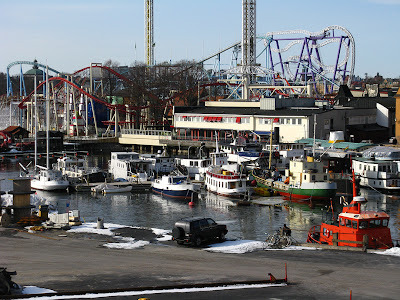 The neighborhood surrounding Djurgårdsvarvet (Djurgården’s shipyard) is an absolutely charming example. 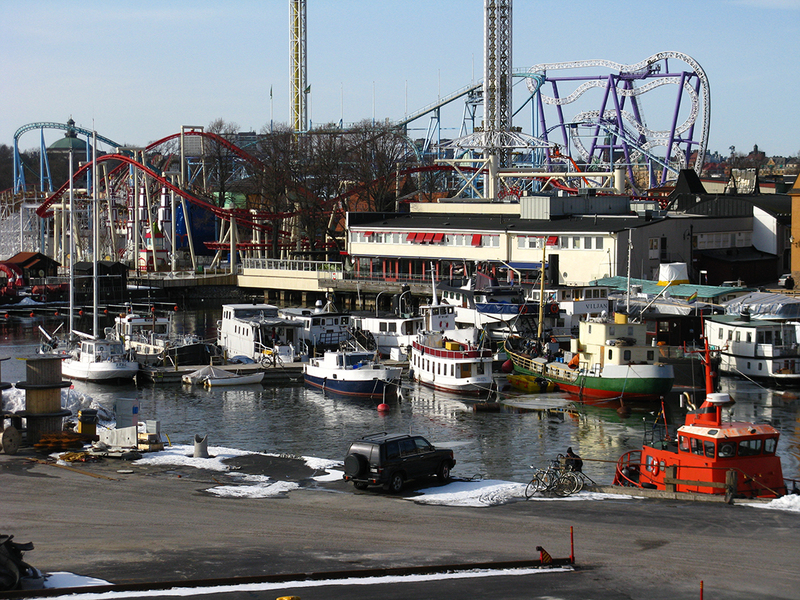 Djurgården is a large, lightly developed island just to the side of downtown Stockholm. (For a sense of scale, Djurgården is 689 acres while Norrmalm/downtown Stockholm is only 385 acres.) The island has been inhabited at least since the late iron age as there are grave fields and evidence of farming activity on the island dating from 550 to 1100AD. In 1286 King Magnus Ladulås acquired part of the island, and King Karl Knutsson acquired the rest of the island from the Klara Cloister in the 1400’s. The island is still in the possession of the crown today. During the 14- and 1500’s, the crown mainly used the island to graze stock, but in 1579 King Johan II founded a hunting ground on the island. The hunting ground was stocked with moose, reindeer, and elk. In the early 1600’s, Queen Kristina visited the island to watch ballet performances, to visit her lion (booty from when Sweden plundered Prague in 1648), and to gaze at fireworks. 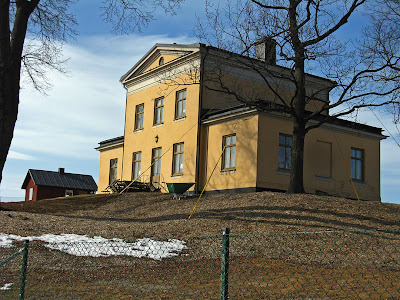 King Gustav III opened the island in the late 1700’s for public amusement. Since that time, the island has developed into a national city park with green, leafy forest paths and meadows with herds of grazing royal sheep. 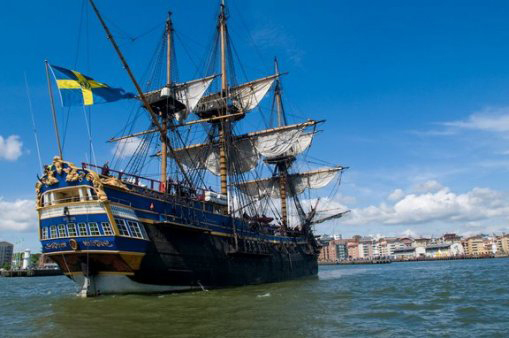 The island also houses some of Stockholm’s foremost museums including the Vasa Museum and Skansen as well as some of the city’s less noble diversions such as an amusement park and a casino. While most of the island has always been a leafy retreat from the city, the northwest shore has been the site of hard, heavy labor since 1633 when a pitch operation was founded on Beckholmen, or Pitch Island, just off the coast of Djurgården. 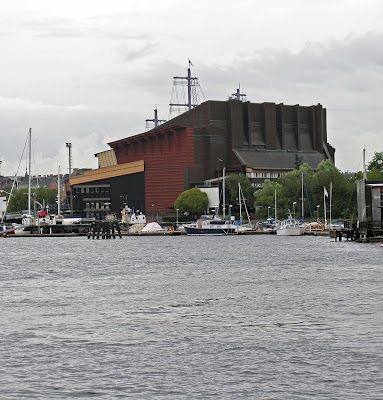 Soon after, in 1720, Galärvarvet or the Galley Shipyard was founded on Djurgården’s shore a bit north of Beckholmen. Another shipyard, Djurgårdsvarvet, was founded in 1735 on the shore close to Beckholmen. Most interesting for me, however, is that a neighborhood housing shipyard workers and their families as well as all the necessary derivative businesses (a bakery, an inn, etc.) organically grew near the shipyard. That neighborhood still exists today. Before I delve into the neighborhood, I’d like to explain a little about the industrial activity that supported it. At the time that the pitch operation was founded on Beckholmen, pitch (boiled from tar) was Stockholm’s foremost export good and Sweden had the monopoly on pitch within the Hansa League (the trading organization that ruled the Baltic Sea during the middle ages). In 1690, a two-story log cabin was built for the overseer. 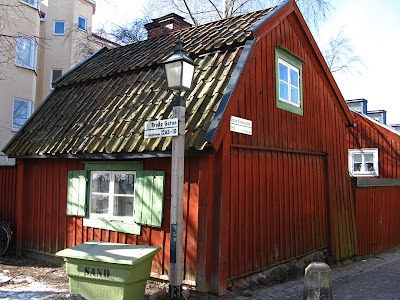 While a log cabin sounds rustic, it was actually the norm as just about any building in non-downtown Stockholm was a log cabin at this time. Today, most of the surviving log cabins have been covered in a protective layer of wooden siding to prevent the structural timbers from decaying; the overseer’s house is no exception. 1809 proved to be a death-blow to Sweden’s pitch industry when Sweden lost Finland to Russia because one of pitch’s required raw ingredients could only be sourced in Finland. 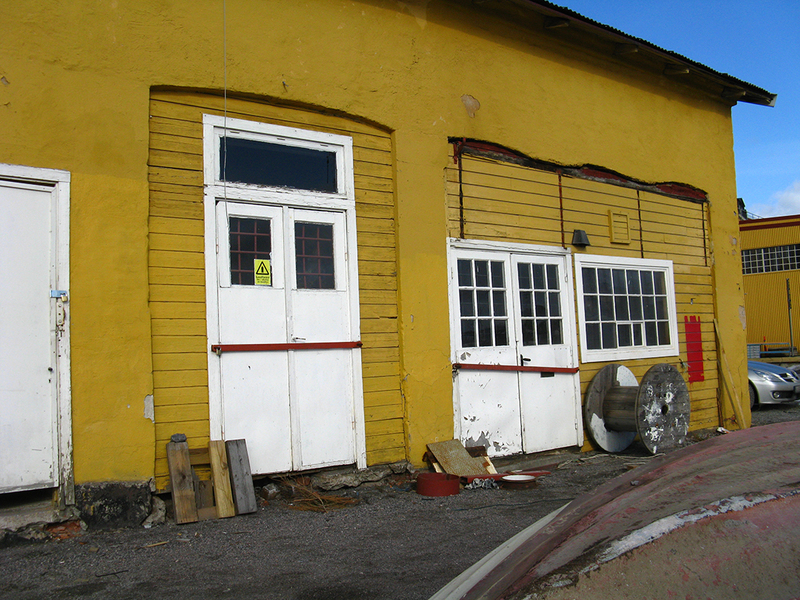 The pitch operation on Beckholmen was forced to close. However, the mid-1800’s saw the number of steamships rise in the Stockholm Archipelago. There was a need for a shipyard to repair the boats, so Beckholmen was reallocated for this purpose and two dry docks were dug into the island. Steam pumps pumped out the water once the lock-like doors closed behind the ships. By the 1870’s, the log cabin was no longer posh enough to house the dock master and architect Axel Kumlien was commissioned to design a new dock master’s house. This new house is much more formal in style and it sits on the highest point of the island, commanding a view over the dockyard and out to the water. A new and longer dry dock was added in 1923 in order to service the navy’s cruisers and armored ships. The new dry dock was 197 meters long—more than two football fields! Business for the shipyard slowly declined over the 20th century, and it went bankrupt in 1991. It more or less sat idle until recently when the dry docks began to be hired out to private individuals who need to do work on their privately owned, historic boats. These days, the boats are much shorter, so several boats float into the dry dock to be worked on at the same time. The shipyard now assists the repair and restoration of over 100 boats per year. The island was historically private with little or no public access. This changed recently, however, when the city removed, remediated, and replaced 100,000 metric tons of earth on the island to remove all the poisenous traces of pitch boiling from the island. The island is now part of the Djurgården park and a public path leads visitors around the island. Closer to Stockholm’s mainland, the Galley Shipyard began in 1720 as a place to pull galley ships on shore for winter storage in special sheds. The shoreline was filled in so that 30 ships could be docked and stored at the same time. In the 1800’s, the shipyard transitioned to being a worksite for repairing and maintaining Swedish navy ships. The navy continued to use the site into the 20th century and 1200 employees were stationed at the shipyard during the Second World War. However, needs changed and the shipyard closed in 1969. Most of the site is now a public park, although large, historical boats still line the quayside. The Vasa Museum lies over one of the shipyard’s dry docks—the boat was floated in, the water was pumped out, and the building was completed around the beautifully restored ship. Other than the docked boats, there is little trace of the area’s previous use. However, a small nearby cemetery contains graves dating back to the 1700’s. Those resting in the cemetery include boatswains, carpenters, journeymen, gun smiths, horn players, skippers, privates, officers, admirals, generals, government ministers, governors and priests. In 1963, ten bodies that came up out of the water inside the Vasa ship were also buried here. Further along the island’s coast and just across from Beckholmen, Djurgård’s Shipyard was founded in 1735. Hundreds of boats were built here including Amphion, King Gustav III’s headquarters boat in the war over Finland against Russia. In addition to war boats, cargo transport brigs, schooners, sloops, and galleys were built here, including boats for the Swedish East Indies Company. The Gothenborg III was not built at Djurgård’s Shipyard but it is an example of the type of East Indies cargo ship that the shipyard constructed. but the rest of the area became more and more dilapidated and abandoned until the 1980’s when there were plans to tear down the area and build 9-story apartments at the water’s edge. The financial crisis blocked the apartment plans and after sitting idle for 10 or 15 years, the area is now being renovated. 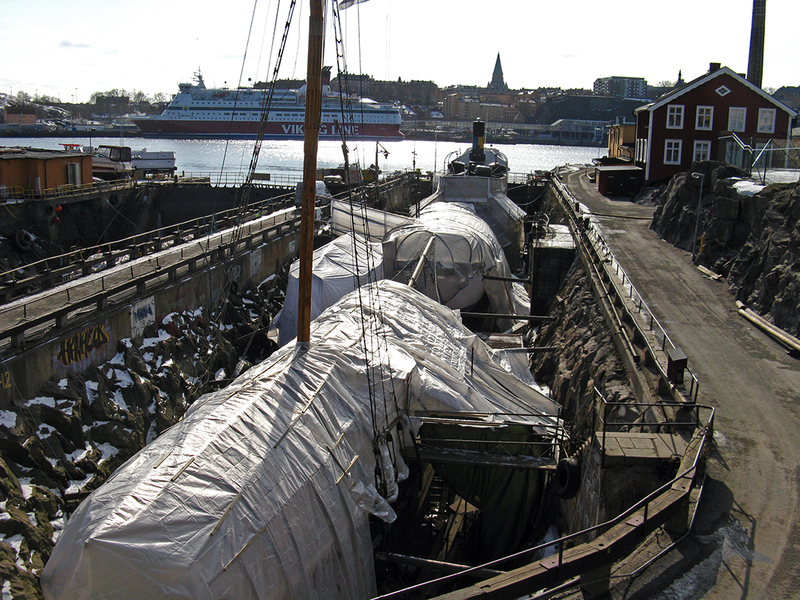 It, with the Beckholm dry docks, is a center for the restoration of historical wooden boats. 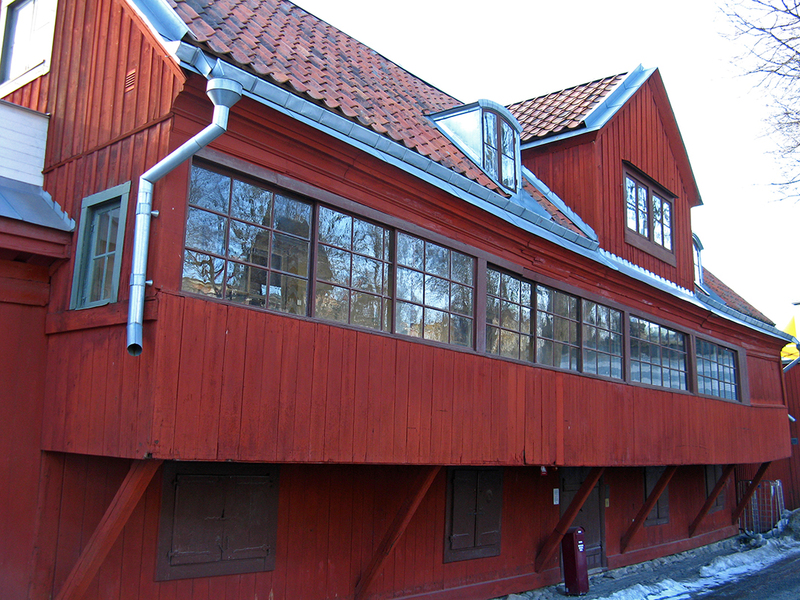 The buildings along Breda Gatan (Wide Street) were mostly built in the early 1800's. During the summer, the street has a more "country" feel with the roses blooming along the foundations. 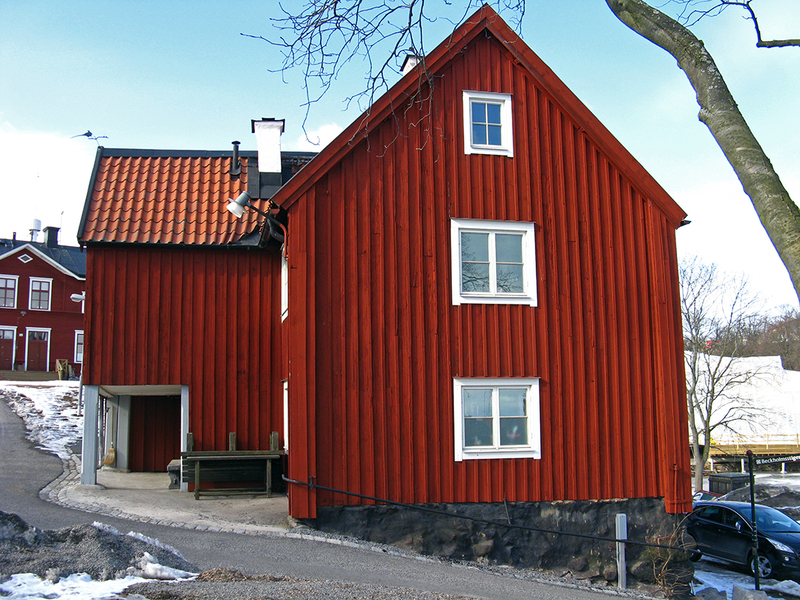 This tiny, intact neighborhood just inland from the Djurgård’s Shipyard is the area’s jewel. Tiny, narrow, cobblestoned lanes lead past a motley assortment of historical dwellings and sheds. The mostly wooden buildings exude an antique charm and retain their original detailing. The small neighborhood lies just off the main island thoroughfare, yet it is quiet, seldom visited, and nearly untouched. The neighborhood was originally called Båtsmansstaden, or Boat Man’s City, when Queen Kristina built a small hospital with 14 small recovery cottages for sick and injured boatmen. 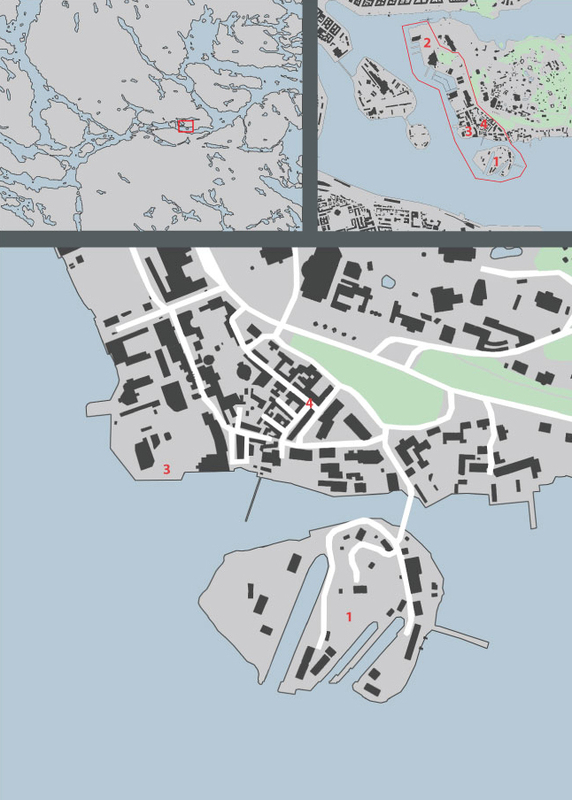 I don’t believe that any of these buildings survive, but the area continued to be occupied by boatmen as it later developed into housing for those working at the Djurgård’s Shipyard in the 1700’s. This shipyard housing is what one can wander through today. This little cabin was built in 1749 and has a gambrel roof toward one side and a gable roof toward the other side. There is a small peep-hole in the window shutter allowing a resident to see what's happening in the square. Built in 1755 to house shipyard workers. These cabins were built in the mid 1700's by/ for shipyard carpenters. This more grandiose building was built in the 1750's to house shipyard offices as well as office workers. While most of the buildings in the neighborhood were built by the workers for themselves and are therefore quite modest, this building was built by the shipyard company and is therefore much more stately. This cabin was built in 1770 by/for the local gravedigger. This large building started out as two simple one-story log cabins. The cabins were given an attic level and connected together in the beginning of 1800’s to serve as the inn. I don't know the history of this building but it's my favorite in the neighborhood. I suspect that it is from the mid-1700's. I like how the roof changes from front to back--the front hip shape gives the cabin a more up-to-date look at the front door while the back facade remains as simple as possible. I found it interesting that the buildings along Breda Gatan (Wide Street) have ground floors that are only a couple of inches above street level. The neighborhood is perched upon a cliff and therefore has no danger of flooding from the sea. However, buildings on a plinth are usually experienced as being more impressive than lower buildings. Perhaps the nearly-level transition between street and indoors was meant to facilitate commerce. There are 200 residents in the area today; in the mid-1700’s the number was probably more like 600. The historical buildings are now mostly owned by the city and rented out. I can only imagine that it takes 20 or more years in the housing queue to get one of these charming apartments! A few of the buildings are privately owned, but they are expensive: a 1076 sq ft apartment is currently for sale for 9.9 million Swedish kronor or $1.5 million! I moved to Stockholm from San Antonio, Texas with my Swedish husband in August, 2011. I am an architect and am fascinated with buildings, urban history, and city planning, which is why I have been walking and walking and walking through the city and reading about Stockholm's urban history. I hope that you'll find Stockholm as beautiful and as intriguing as I do! Copyright 2011, 2012, 2013, 2014, 2015. Powered by Blogger.